Massaman curry is a rich, relatively mild Thai curry. So easy and delicious, just follow the recipe down below. 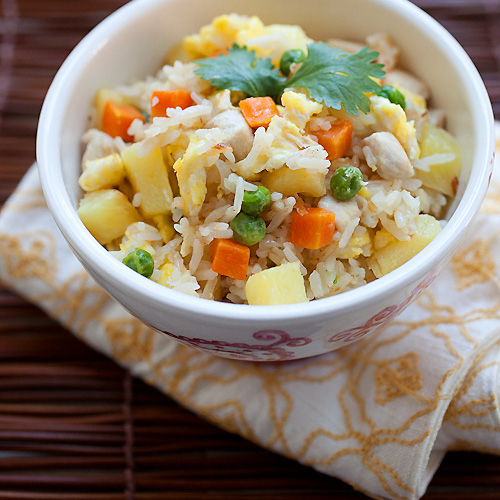 Massaman curry is a popular Thai curry that is rich in flavor. It’s made with coconut milk, beef, potatoes and peanuts. It’s often made with beef but you can use chicken. While you can make the Massaman curry paste from scratch, store-bought curry paste will work just fine. It’s very convenient and delivers amazing authentic flavors. What Spices are in Massaman Curry? There are many spices used in Massaman curry, such as green cardamom seeds, cinnamon sticks, cloves and star anise. The curry paste calls for dried red chilies, garlic, lemongrass, galangal and shrimp paste. This beef Massaman curry recipe does take a bit of time to cook as you want to slowly cook the beef so it becomes tender, soft, and melt in your mouth. The active time is actually really short, so you can watch TV, read a magazine while waiting for the curry to cook. The method is very easy. For best results, marinate the beef with the curry paste. Next, stir fry the spices before adding the beef. To make the curry sauce, add coconut milk, fish sauce, water, potatoes, peanuts and palm sugar. The curry is done when the beef becomes tender. Massaman curry is good for you as it is 553 calories. This recipe is from Taste Buddies. Beef Massaman Curry - crazy delicious Thai beef massaman curry. Learn how to make massaman curry with this easy and fail-proof recipe. Coat beef in 1 tablespoon of oil and massaman curry paste. Stir well and set aside. In a large pot, heat remaining oil over medium heat. Stir-fry the cardamom, cinnamon and star anise for 40 seconds. Add the whole shallots and fry until golden brown. Add the beef and brown for 1-2 minutes. Stir to mix well with the spices. Add 1 can of coconut milk, 2 tbsp of fish sauce and 1/2 to 1 cup of water until the beef is just covered by the liquid. Stir well and then bring to the boil. Once boiling, turn heat down very low and cover. Gently simmer for 1 hour. Add the remaining can of coconut milk, potatoes, peanuts and half the basil leaves. Stir well. Taste and add a little more fish sauce if necessary. Turn heat up to medium-low and cover. Cook for another 30 minutes or until potatoes are tender. Once the potatoes are cooked, remove the curry from the heat. Stir in the palm sugar, tamarind juice and remaining basil. Stir well and serve the curry with steamed rice. All photos and recipes on Rasa Malaysia are copyright protected. Please do not use the photos and recipes without prior written permission. If you wish to republish this recipe, please rewrite the recipe in your own words instead of copy and paste and link back to //rasamalaysia.com/beef-massaman-curry-recipe/. Thank you very much! Oh, this sounds so wonderful. I took cooking classes in Pattaya while on vacation a few years ago. And I just planted a Kaffir Lime tree on Wednesday. I am looking forward to more Thai cooking. Thanks for this Massaman recipe! I seldom cook curry but I am attracted by your recipe, which uses roasted peanuts and fish sauce.I love roasted peanuts so I will find a chance to try this Thai cuisine! But why do we add coconut milk in two times? The first addition of coconut milk is to tenderize the meat and provide a base for the meat to cook in so its not dried out. During the first heating of the meat the coconut milk breaks down and requires the 2nd addition of coconut milk to provide the richness, creamy texture, taste and mouth feel that we all love when eating a good curry. Hope this helps. Can we use yoghurt instead of coconut milk ? Awesome n delicious! I’m so going to cook this. :) Thanks for the recipe. I love masamman curry because I am Malaysian. All the other Thai curries such as red curry, yellow curry and green curry are all too rich and sweet for my taste. Masamman curry is closer to the curries in Malaysia but we don’t use fish salt to flavour curry. I love the pinkish beef in the first photo, looks so tender and yummy. Never tried masamman curry before, will have to order it the next time when I go to Thai restaurants. Hi everyone, thanks for your comments and glad you like the recipe. Limpepsi, in response to your question as to why I had the coconut milk twice…this is because the first time I add it, it just covers the meat. As it boils down, it becomes more and more concentrated and this results in the beef absorbing the intense flavours. The second batch of coconut milk is added to dilute the concentrated liquid. This is the stage when the potatoes, peanuts and basil are added. Hope this helps. My husband made this tonight and it is excellent. My mouth was watering while it was cooking. It is definitely a keeper. Thank you! Ohhh looks amazing Syrie. This is one of my all time favourite curries (indian, thai or otherwise). Your version looks fantastic. Thai curries are so wonderfully deep in flavor but at the same time have a vibrant fresh note…that’s why I love them! :) I have a bunch of these curry pastes in my pantry…I should pull out the massaman one already and use it for this! I always love potatoes in my curries, they are always so nice. Thanks for the massaman recipe, will have to get the instant curry paste to try it out. This recipe is almost exactly like what my grandmother, who is of Indian/Hyderabadi descent. makes. 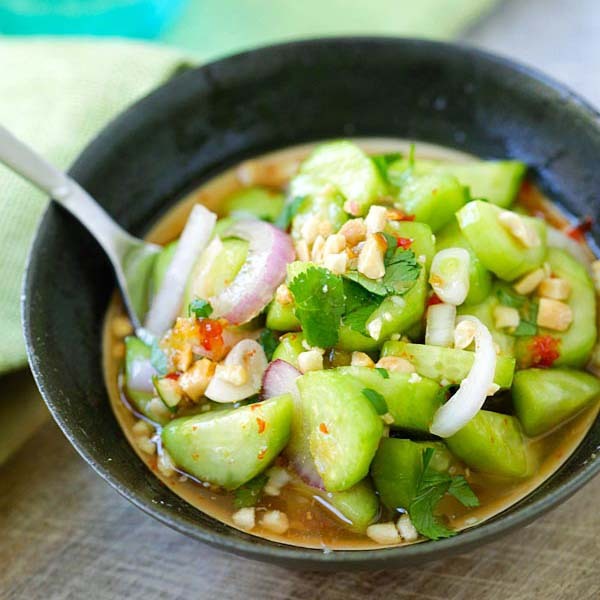 I think the differences is the addition of basil leaves and peanuts, which of course make the recipe distinctly Thai, but this is a very common dish amongst Muslims in India/Pakistan as well. The proper name escapes me, but I just call it aloo-gosht, which literally translates to potato meat. It’s got about 30 recipes each one with a cooking video to go along. Congrats on the invitation. This looks incredible, the beef is oh-so tender, simply edible :)! I know I am late, but I want to share what I know in this coconut milk topic! In Indonesia we also add coconut milk twice to the dish. The reason is because coconut milk, esp. the thick one, will “break” (the fat/oil is separated from the water) if you heat it too long. So at the beginning we add thin coconut milk to stew the meat, and at the end we add thick milk to give a rich broth. Hope this helps! The best massaman curry I’ve ever cooked! Thank you very much for sharing the recipe! I’ll surely cook this again. Wonderful recipe, and found just in time for my curry paper;). I am lovin’ learning about curries. Nurul i used the Valcom brand thai style massaman curry paste available from Coles or Woolwoths and that seem to work fine. I have been wanting to make this for a long time but I have one reservation. Since the whole spices are never taken out how do you eat it in the end? The star anise and cinnamon sticks are large enough so that you can avoid them, but doesn’t biting into whole cardamon pods taste kind of bitter? Am I missing something? We usually buy take away from our local Thai Restaurant in Bundy. I always order their Massaman. Just love it to death. I cooked some lamb in a slow cooker yesterday and thought I might try make a Lamb Massaman. Found this recipe, looks like what I usually order so wish me luck. Just off to the asian grocer for a couple of the ingredients. Hope he has the Massaman paste. Will make do if he doesn’t. Keep you posted. Cheers. Love chicken Tikka Masala too will have to try that next. Yummo. Long time lurker, first time poster! I’d like to make this for 8 people but I’m unsure whether I should double the spices. Would they become too overpowering if I did so? Great Massamn curry and very easy to make. It takes a bit of time but the end result is well worth the effort. One suggestion – watch the amount of liquid added, as I used less than the recipe specified to avoid the curry sauce becoming too thin. my boyfriend made this for dinner…. super phenomenal! Hi Bee, I would like to thank you another fantastic recipe. I love beef massaman and was very interested in trying your version. I have to say it was fantastic. Loved every mouthfull. I will be following your site more often if this and the last recipe I tried are that good cant wait to try your others. Keep up the good work and most importantly willing to share it with the world thanks. Your new fan. I’ve made this a zillion times, super recipe! Quick question, it’s been ages since I’ve made this, should I take 10 cardamon pods and use the seeds from those 10 pods, or is it just ten of the little black seeds that come from the pod? Thank you so much! Should I take the seeds from the pods? :) Or just use the pods whole? Again, thanks so much for the awesome recipe!!! Just cooked this for dinner and was so happy with the result.. Everyone said that it tasted better than the ones served in restaurants in the Philippines. I must say I used fresh coconut cream and milk because of its abundance in our country.. I also blitzed the shallots, cardamom and cinnamon which I heated in the oil…… Thank you so much for this wonderful recipe… Till I try the next one…. What size coconut milk is used in the recipe? I’ve eaten a “Mussulman curry” at my favorite thai restaurant – it was superb. I’d love to cook it. Don’t think I can find any Mussaman Curry Paste where I live, so can you speculate on what’s in it, so I can try to make the curry paste myself? Also may I please ask why do you put basil? I’m planning to cook this dish this evening and looking forward to hearing from you soon. Sure, all sounds good, Thai basil makes the curry better. Hello. This recipe looks wonderful, and I would like to make it this week. I was wondering if you think it would be okay to substitute yams, or sweet potatoes for the white potatoes? Thanks in advance for your advice. I think you can do that. I cooked this dish over two evenings. After simmering the beef for an hour I left it to marinate over night. The following evening I brought the curry to temperature and added the potatoes and coconut milk and basil to simmer and cook for 30 mins. I didn’t need to add the palm sugar or anything else- the flavour was so rich and gorgeous, the consistency thicker than Thai curries- meat so tender- it was really lovely, big favourite. Highly recommended, great recipe. Thanks Peps for trying this beef massaman curry. Hi, may I know where I can get massaman curry paste in Singapore? I am not sure but I bet you can find it at Cold Storage or stores what carry international products. 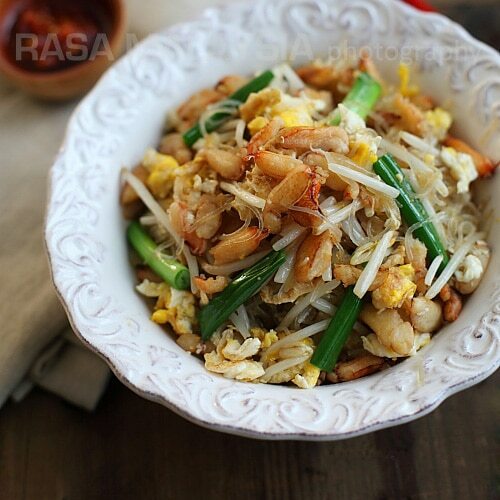 “Made this and as usual Rasa Malaysia recipes do not disappoint. It was a hit!” Verbatim, my husband said… “That was so good!” I would only use 1 cinnamon stick next time though. Furthermore,I have to confess I did not follow the recipe entirely (never be afraid of substituting for similar ingredients), as I did not have everything on hand. I had a nice 1 lb top sirloin thawed but wasn’t sure what I wanted to do with it until I came across this dish. I love dishes that stretch out protein, making an economical meal. My substitutions were as follows (there were a lot): I used three new medium sized potatoes (1 per person); a combo of basil and bayleaf for the Thai basil; ½ a lime with an additional 1/2 tsp of sugar for the tamarind; 1 cup of water with powder coconut milk for the 2 X5.6 oz. coconut milk; 3 cloves of garlic minced; 1 inch of sliced ginger; and lastly I used coconut sugar to replace the brown sugar. Can’t wait to try it according to the recipe next time. I am sure it will be great, as I have found with all the recipes I have tested from this site, so far. 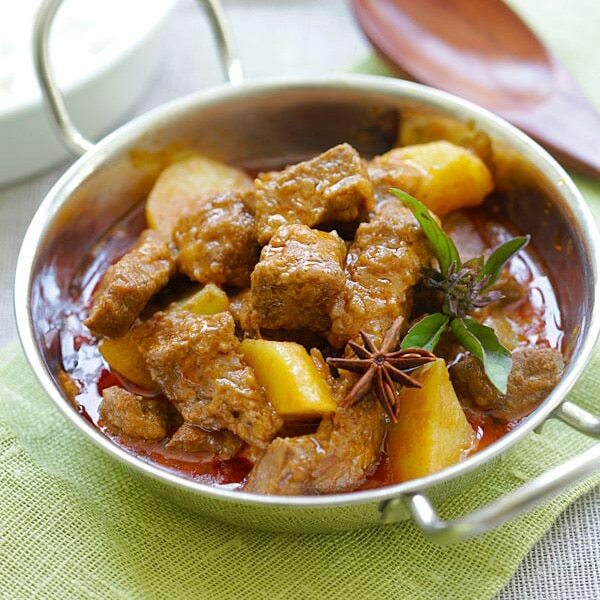 Thanks Marni for your rave review on this beef massaman curry recipe. Marni, looks like you might need to start your own fb page. Rasa I’m trying your recipe tonight. Love the tip regarding the 2 cans of coconut milk. My other tries at making Massaman curry are that they are a tad dry. can you comment on what brands of Muss. curry paste are the best to buy? I don’t want to miss out or use something second rate. You can buy Mae Ploy Maesri. I prefer the latter because you can get a smaller can. Quite a few people asking for curry pastes. Whilst I cannot help those not in Sydney, for the rest of you, go to Paddys Market and up to the First Floor. Inside is an IGA store which carries Asian Groceries. As soon as you walk in, the Thai section will be staring you in the face (signs showing different countries) at each section entrance. On the left hand side, first section you will find Authentic Thai Pastes for around $1.00 each which are imported from Thailand. Tried them all and had a little play as well. Can highly recommend the Green as being the best blend Ive ever eaten. Very warm. Massaman really good as well, but Im still messing with a few things and this great recipe could be my answer to what I seek. One more tip for you which is out of left field. Try baking these curries in the oven, 190 degree’s for around 75 minutes plus extra if beef and see how those flavors intensify. In a rush one day, couldn’t hang around so dumped it in and baked. Love your recipes and thanks for taking the time to post them up Bee. Thanks for your sweet comment Jeffrey!